What is a Fixed Spiritual Space? Fixed Spiritual Space is something we highly recommend if you are serious about your spiritual enrichment. Fixed Spiritual Space is an area you create that is devoted solely to your personal meditation. It can be a room set aside for your spiritual practice — but don’t worry if you don’t have that much space to spare. It could be a section of a room, a corner, even a window sill set up with some spiritual items. The key is to create a spot where you can go, and know immediately that this is your sacred place of spiritual enrichment — your Fixed Spiritual Space. How Do I Set Up a Fixed Spiritual Space? Step 1: Select your space carefully. It is important that this space be totally dedicated to your spiritual enrichment and growth — a place where you can experience your spiritual practices without interruption. 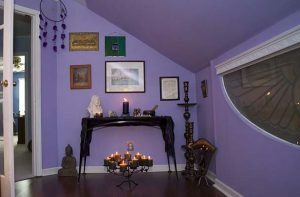 Our area reflects our eclectic approach to spiritual practices. We have a singing bowl, chimes, busts of Jesus and Buddha, the Unity wings, and more. Step 2: Design your space to create a relaxing environment, conducive to your spiritual practices. Everyone designs their space differently — and this is really fun to do! You might choose candles, statues, pictures, pillows, stones, or other artifacts that have meaning for you. Pay attention to the colors you use. Select music that helps you relax and meditate — music that soothes the soul. You may want to find a timer of some sort that has a soulful ringer — there are several apps available that allow you to set the time, and have it “ring” with a chime, nature sounds, or peaceful music. Step 3: Continue to refine and create, as you make this Fixed Spiritual Space your own. Designing your Fixed Sacred Space is an ongoing process. You will continue to discover items you want to add that enhance the spiritual enrichment effects. An added benefit: the more you use this space, the stronger the energy will be. You will begin to notice a shift of the energy the moment you enter your Fixed Spiritual Space — a transforming power that touches the depths of your being. What Do I Do in My Fixed Spiritual Space? Now comes the best part! Once you have created your Fixed Spiritual Space, you can use it to create a regular daily habit of Spiritual Practices. There is no limit to the types of Spiritual Practices you can perform in your Fixed Spiritual Space. In fact, we recommend you try a variety of activities to discover which ones work best for you. We are including some of our favorite Fixed Spiritual Space Practices here. Let us know which ones you try, and how they worked for you!